We are passionate about sharing the joy of pet companionship and The Pet Foundation has set out with a mission ‘to enrich the lives of pets and people who love and need them,’ Petbarn does not sell companion animals such as kittens, cats, puppies and dogs for profit. We also do not sell small animals such as rabbits, mice, rats or guinea pigs. Instead, we partner with animal shelters and house pets waiting for a new home in our adoption centres which are located in selected Petbarn stores. This means, if you adopt a pet from a Petbarn Adoption Centre, 100% of the adoption fee is returned to our adoption partners. We have helped re-home thousands of rescue pets on behalf of our adoption partners. Australia is a nation of pet lovers with more than two thirds of households owning a pet. Sadly, those homes aren’t always forever with hundreds of thousands of unwanted pets being surrendered to animals shelters every year. Petbarn are actively involved in raising awareness for pet adoption. Since opening our first Petbarn Adoption Centre in 2012, we have helped re-homed thousands of rescue dogs, cats, puppies, kittens and rabbits on behalf of our partner animal shelters whom we partner with closely. Here are some pet adoption stories that have given pets a second chance at living happily ever. 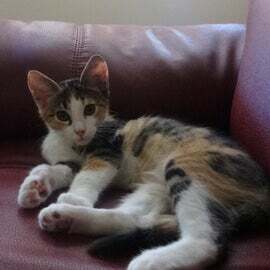 We're so happy with our new kitten 'Tiny' she's so friendly, purrs constantly so has adjusted really well, kids love her. The process from pet rescue was really easy, were very happy & glad to save a life! I adopted Mary the kitten at the beginning of July and she has been a wonderful addition to my household! She's very adventurous (chasing shadows around on the floor) and loves cuddling up on my lap whenever I'm relaxing! My new best friend is beautiful! My new Fiancé and I decided it was time to adopt a cat to call our own. We walked into Petbarn Nunawading and fell in love immediately with Natasha, the 10-month-old kitten. We went home and talked about it. Later that we week we found out that she had been there for a few months and no one wanted to adopt her. We got the news that she was ours and we were sooo excited. We went to the shops and bought everything possible for her. 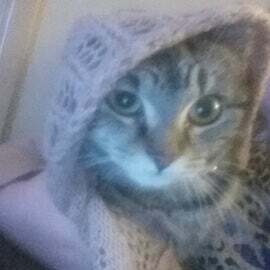 She now lives at home with me, my fiance, my mum and dad and brother. We have 1 other cat and dog. She fit in automatically and its only been 2 days!! We are so excited to watch her grow and to watch her personality come out. 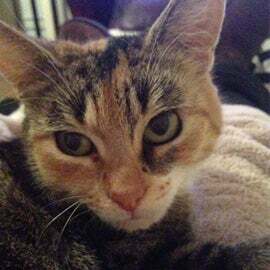 Thank you so much Petbarn for your quick response from Cat Corner of the adoption and for all your lovely help in getting her the correct food and information. We adopted our lovely boy Frosty Fruit from Petbarn Northmead. Strange name for a cat but it does suit him – he’s orange, sweet and refreshing! 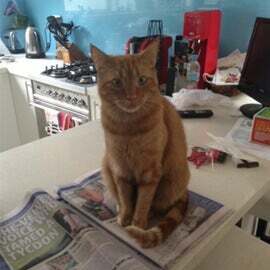 He is a very affectionate cat who loves nothing better than trying to snuggle on the kitchen bench while food is being prepared – he does love his food! We had some early struggles with our other 2 male cats but they are all putting up with each other now – while not the best of mates there’s no fur flying. 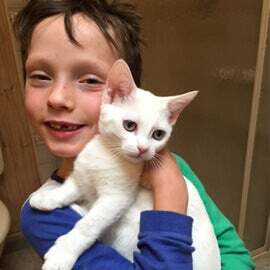 We are so pleased that we met Frosty when we did and are thrilled that he is a part of our little feline family. I wasn't planning on getting another cat as I left my one to my mum to keep her company as she was lonely. But I walked into Nunawading Petbarn about two weeks ago and absolutely fell in love with a cat up for adoption by the name of "Magpie". Straight away I could tell that he was so full of love and needed copious amounts of attention. I refused to leave the cage he was in, I physically couldn't I was so In love so I decided to adopt him. 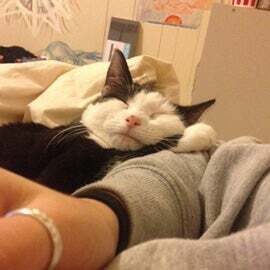 He now goes by the name of Rufus and he is such a beautiful cat, he adores everyone and makes sure they know it too. I called in at Petbarn Campbelltown as I was near there and needed food and treats for my cat and dog. I saw Marmalade in her cage and she was the image of my cat Lucy when she was a kitten. I was tempted to take her there and then. But decided to go home and talk to my husband and think about it overnight. I thought I will go back tomorrow afternoon and if she is still there it's meant to be. So I went back and there she was on her own so I adopted her. We have named her Minnie as she is Lucy's Minnie Me. She has settled in well and has a lovely nature and loves cuddles. Together with our adoptions partners* we have developed a process that ensures the highest level of care for the animals within Petbarn Adoption Centres to make certain that they will go to loving homes. *The adoption process may vary between partners. 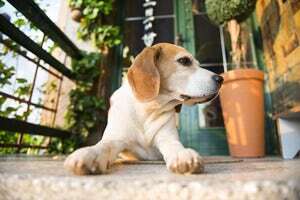 Our adoption partner assess the pet’s suitability for rehoming. All adoption pets have undergone a comprehensive vet check and been de-sexed. 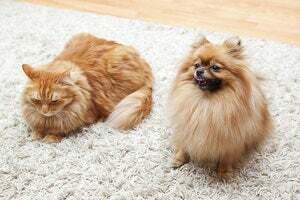 In all cases dogs and cats are micro chipped, treated for internal and external parasites (such as worms and fleas), and had their initial vaccination and dogs are also treated for heartworm. Our partners bring their shelter animals to Petbarn. Purposely built and installed enclosures have been designed for pets to stay in while they are in Petbarn Adoption Centres and waiting to be rehomed. All Petbarn enclosures have been designed to exceed the dimension requirements set out in the Pet Shop Code and have been built at the cost of Petbarn. Dedicated Petbarn staff personally care for all adoption pets. While being cared for in Petbarn Adoption Centres, staff see to all the pets needs including feeding and checking the health and wellbeing throughout the day. Dedicated staff from the adoption partner also ensure the pet is cared for during their stay. When a prospective pet parent shows interest in adopting one our adoption pets, a Petbarn team member will spend time explaining the adoption process and ensuring there is a good connection and responsible intention between them and the pet. In the best interest of the pet, no pet is adopted until a thorough interview is conducted with the potential pet parent in line with our adoption partner procedures. The fee of adopting a pet will vary and is set by our adoption partners which is paid by anyone adopting a pet. The adoption fee is collected by Petbarn and passed directly onto the adoption partner. 100% of the adoption fees are returned to the adoption partner. Petbarn does not profit from adoption fees. Petbarn is proud to provide food, housing and dedicated staff to caring for the adoption animals while in staying in Petbarn Adoption Centres. Making the decision to adopt a pet can be incredibly rewarding. You’ve gained a friend and saved a life! 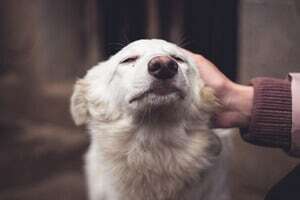 As pet ownership there’s a lot to learn to ensure you’re doing the very best to take care of your pet’s needs so they live a long, healthy and happy life. Thinking of adopting a furry friend? Here’s what you need to know before welcoming a cat into your family. Is it better to adopt a puppy, kitten or older pet? Junior or senior, that is the question. We take a look at the pros and cons of adopting a youngster versus a more mature pet. Does a rehomed pet ever really settle down? Adopting a pet is an exciting, often chaotic time – but you can help your new friend settle in and settle down.